Development of a targeted drug delivery system for the uterus to ensure that drugs given to women during pregnancy are concentrated at the target site, which is the uterine tissue. This will improve our ability to treat complications that arise during pregnancy, by focusing the therapeutic effect while removing or minimising off-target side effects. The fundamental mechanisms that regulate contractions in uterine tissue during pregnancy. That is, how is the uterine tissue kept relaxed during pregnancy, but then transitioned into a contractile state that is necessary for birth? There are key factors at play during pregnancy, such as hormone levels, physical stretch of the uterus and a myriad of signaling events. I am interested in determining how these factors are interconnected in regulation of uterine activity. Throughout my schooling I found it fascinating to understand how things around me work. This began with understanding basic physical science (such as why is honey viscous whereas water is not?) and developed into a keen interest in understanding the biology of life, where structure dictates function. As such, I pursued a higher education in biological science with the University of Newcastle, and was ultimately inspired to direct my research efforts toward solving the unanswered questions that surround Reproductive Medicine. Within this highly specialised field, my interests span from the initial point of sperm-egg interaction, through to the onset of labour and successful delivery of a healthy baby. The ultimate goal for my research is to be able to tell in advance which women are going to end up experiencing preterm labour, and then being able to prevent that from occurring through providing a specialised, targeted intervention. Through ensuring a healthy birth, the baby is given the best chance of a healthy life. Dr Jonathan Paul is post-doctoral medical researcher for the University of Newcastle. He is based within the HMRI Building and is a member of the Mothers and Babies Research Centre, where he directs his efforts toward understanding the complications of pregnancy and labour. Dr Paul is part of a team that has developed a targeted drug delivery system for the uterus and was recently selected to present his research during the Presidential New Investigator Plenary Session at the Annual Meeting of the Society of Reproductive Investigation. For his presentation, Dr Paul was awarded the Presidential New Investigator Award and has subsequently been featured in multiple research highlight profiles at the Faculty and University level. 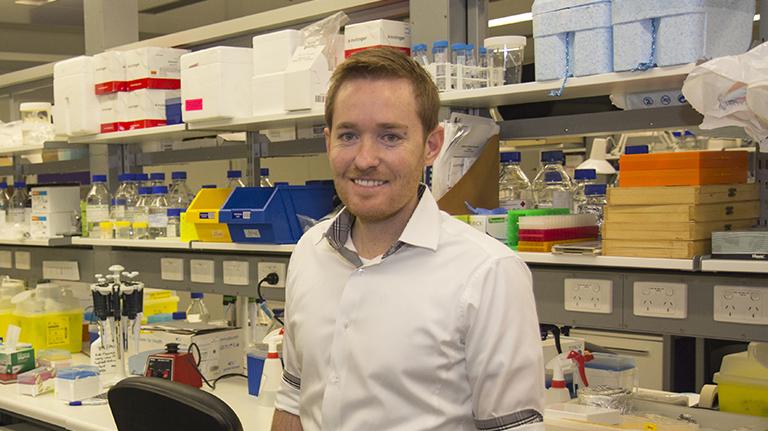 Data generated by Dr Paul has led to multiple patents, including development of the targeted drug delivery system for the uterus, and has served as the basis for successful NHMRC Project Development Grants, which together have brought in over $1 million funding for the University of Newcastle. Through understanding the events that precipitate preterm labour, and having a delivery system through to target therapeutics specifically to the uterus, Dr Paul ultimately aims to be able to integrate the various aspects of his research solve the complicated dilemma that is preterm labour.